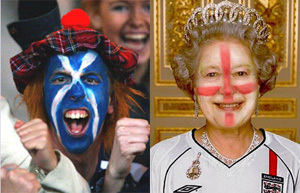 Head to head: English fans and Scottish fans – where does their allegiance lie? Thereâ€™s never been much love lost between the English and the Scottish, especially when it comes to football. So, the prospect of England missing out while Scotland qualify for Euro 2008 is daunting. If Scotland can get a home result against World Champions Italy â€“ a win would seal it while a draw might be enough â€“ they are through while our final game could be over before itâ€™s began if Israel fail to get anything against Russia. Personally, Iâ€™d like to see both teams go through but after listening to a radio phone-in last night it seems not everyone is so gracious. Apparently, there are plenty of Scotsman who will be cheering Russia on Saturday and Englishmen that will be hoping Italy can prevent the Scots getting bragging rights. Weâ€™ve decided to put this to the test by asking members from each nation to vote for whom they will be supporting as the Euro qualifiers come to a head â€“ click through to cast your tribal opinion. Some people hate the English. I don’t. They’re just wankers. We, on the other hand, are colonized by wankers. Can’t even find a decent culture to get colonized by. We’re ruled by effete assholes. It’s a shite state of affairs to be in. Who will England fans be supporting today and next Wednesday? Who will England fans be supporting in Euro 08?